• outstanding shear stability over long maintenance intervals. 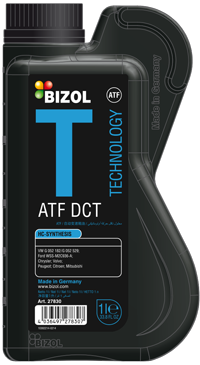 BIZOL Technology ATF DCT is a high performance transmission fluid that can be used in vehicles with double clutch transmissions (DCT), e.g. VW, Audi, Seat, Skoda direct shift gearbox transmissions (DSG), Ford (Powershift), Chrysler, Volvo, etc. To meet or even exceed the requirements of transmission manufacturers using DCT gearboxes, BIZOL applied the latest HC-technology with an excellent additives combination. BIZOL Technology ATF DCT ensures stable friction properties, even under hardest operating conditions.